Perhaps the main influence on the Lake District landscape is that which is exerted by upland hill farming. It's hard to imagine that without any human intervention by grazing with sheep or tree felling, many Lakeland valleys would be densely wooded up to the higher fells. Cumbria has two native sheep breeds; the Rough Fell, which tends to be more common around the Shap fells to the east of the County and the Herdwick which is distributed over much of the central and western Fells. Both native breeds are considered threatened by the Rare Breeds Survival Trust (RBST)﻿ as over 75% of their population are found within a radius of less than 20 kilometres. This makes them extremely vulnerable to disease epidemics such as Foot and Mouth and Bluetongue. 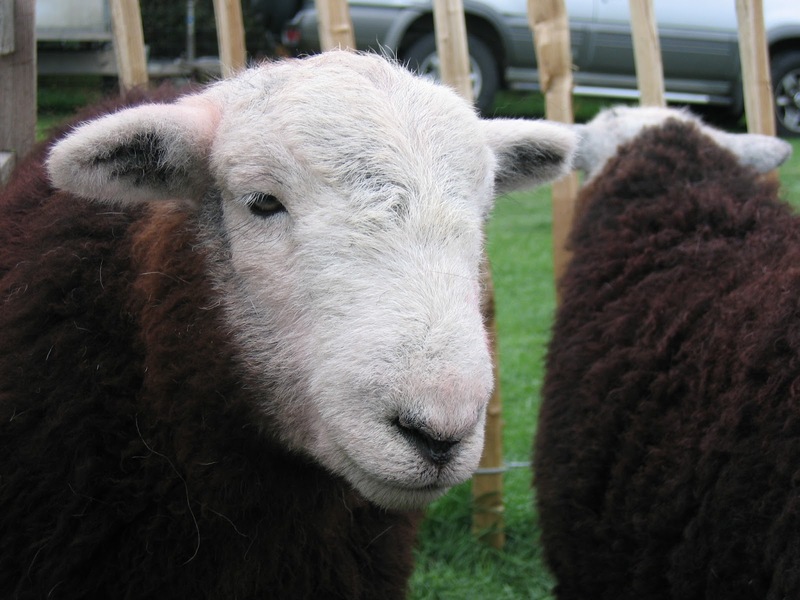 The most at risk of the two breeds is the Rough Fell which is listed as Category 2, Endangered. Although the Herwick is commonly seen around the central Lake District fells, it is listed as a Category 3 breed, which is classed as Vulnerable. The Herdwick is believed to have become established from a flock of 40 sheep that were washed ashore from a Norwegian ship that was wrecked off the Cumbrian coast in the tenth century, but nobody really knows for sure. The Herdwick is an extremely hardy breed and can survive up on the high fells throughout the winter. Sheep owned by different farms remaining mostly separate due to their ability to become heafed (or hefted). Heafing is when individual sheep return to the area of fell where they were weaned as lambs. So if a lamb is brought up on a particular area of fell it will, by and large, remain in that area without the need for any fences. When first born the lambs are very dark brown (almost black) in colour and as they mature firstly their faces start to become paler. ﻿The main body of the sheep also becomes lighter over time and at the age of around one year you have what is referred to as a hogget, or hog. Eventually the hoggets lighten even more in colour to the characteristic grey fleece of the sheep that is most commonly encountered. The fleece these days is worth very little, though it is extremely hard-wearing so is excellent for making rugs and carpets and can also be blended with softer wool to make it more suitable for knitting. Herdwick meat and woollen products are now much more widely available from farm shops and specialist retail outlets around Cumbria, so next time you see some why not give them a try? Over the last few weeks we have been steadily working our way higher up Stickle Ghyll. The section that we are working on has proved to be extremely challenging, as much of the path has become so badly eroded all the soil has now gone and it's right down to the bedrock in many areas. Where the bedrock isn't actually showing it is often just below the ground, right where you want to build the new path! This makes it extra difficult to repair the path as it usually means that the bedrock has to be chipped out with either a crowbar, or sledge hammer, and the path has to be adapted to fit around any underlying rock. The photograph above shows one such section. You can see the bedrock to the right of the photograph and if you look more closely you can see that it stretches right across the path too. What you can't see is that it is also about 30cm (or less) below the current level of the path. Because of this underlying rock the left hand side of the path had to be built up with large boulders, so that the path could be properly tightened between them, and the bedrock that can be seen on the opposite side of the path. Without these large stones, the path would have just been sticking out of the ground, perched on the rock below, and would have quickly fallen out. In addition to this, even more care than usual was put into the selection of each pitching stone. As not only had the path to be suitable to walk on, it also had to fit around the bedrock underneath the path. ﻿Now this section of path is finished you'd never know the full extent of the bedrock. If the path had been left unrepaired it is likely to have eroded right down to the underlying rock and people would have tried to find an alternative route around it. This would have made the erosion damage much worse, and also made any future repair work even more difficult.